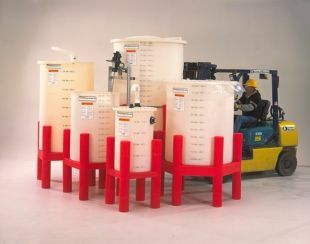 Industrial Poly Tanks - Polyethylene Tanks - Containers for storage and IBC Poly Tanks. Industrial (ASTM-1998-97) and Commercial design standards available. - High-density linear polyethylene (HDLPE)*- black and natural white color - complies with FDA Regulation 177.1520 and National Sanitation Foundation (NSF) 61 standards. Available with seismic zone 4 and UBC 110 mph wind restraint tie-down systems. Call 1-800-221-3233 or email info@liquidhandlingproducts.net for availability. Available in a wide variety of styles, 25-3400 gallons. Horizontal products are available in specific gravities up to 1.9. 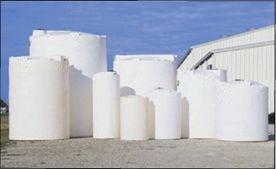 Available in 30º, 45º, and 60º slopes, sizes range from 15-13,000 gallons. 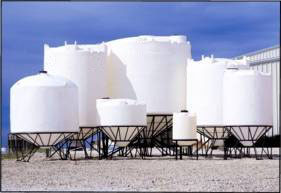 Our revolutionary Captor Containment System is designed to alleviate the ever-changing environmental and safety concerns regarding bulk chemical storage and containment for the 21st century. Whether your company is blending chemicals or looking to improve the features of a day tank system, Our new Open Top Tank Systems provide the perfect solutions to your chemical tank application requirements. 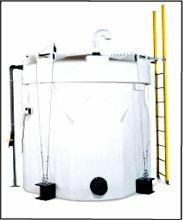 From the stands to the hinged lid designs, Our versatile Open Top Tank Systems are manufactured from 100% virgin HDLPE utilizing Our unique processing technology. 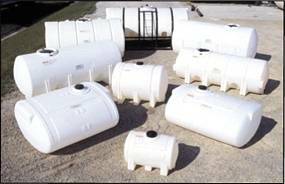 The end result is a durable, long lasting batch tank system that won't dent or corrode.